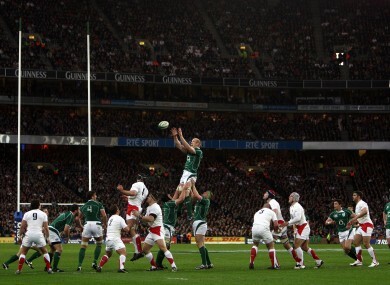 Paul O'Connell claims a line-out against England at Croker. THIS WEEK’S COLLECTION of our happy memories from GAA Headquarters could be filled many times over with football and hurling highlights; that much goes without saying. But over the years, and especially in recent times, Croke Park has become a witness to sporting history in a much broader and diverse sense. And so with apologies to Maurice Fitzgerald, Seamus Darby and the countless others who could have (and probably should have) made the cut, we’ve cast a wide net to celebrate seven iconic moments on Jones Road, starting with a man playing hurling in his bare feet. In 2011, it’s almost unthinkable that an athlete would be allowed to step out onto the pitch without his laces tied correctly, not to mention barefoot. But that is precisely what the legendary Michael “Babs” Keating did in the 1971 All-Ireland Hurling Final. It was Tipperary against Kilkenny and the Premier were relying on their star man if they were to have any chance of ending their six-year wait for the Liam McCarthy Cup. There was a small problem, however. As he tells it himself, Babs had dropped his boots in for repair a couple of days before the final and in the process of adding a stud or two, the cobbler had hammered one of the nails in too far. Unable to play in one boot, Babs took the pair of them off; and unable to play in his socks, they came off as well. He went on to knock over seven points as Tipp won by 5-17 to 5-14. Like it, loathe it, or simply stand tall and stare resolutely back at it, the Haka is one of the most iconic spectacles in all of sport. So when it comes to town, as it did in November 2008, it’s a pretty big deal. Forget about the fact that in the 80 minutes that followed, the All Blacks were masters of Croke Park, strolling to a 22-3 win. For the 90 seconds of the Haka, Ireland — and the Irish crowd specifically — ruled supreme, creating a swell of noise that engulfed and overwhelmed the Maori call to arms, diminishing its threat and readying the Irish troops for battle at the same time. Muhammad Ali — “The Greatest” — fought 61 times over the course of a quite brilliant professional career. But there was something peculiarly Irish about the night he togged off in Croke Park to take on Al “Blue” Lewis in 1972. It may be the fact that Ali, a global superstar, only managed to sell 20,000 tickets for the fight; Irish people never really buy into the whole “cult of celebrity” thing, do they? Or that as the opening bell sounded, crowds of ticketless fans streamed through Drumcondra, up Jones Road and into the ground, happy to watch one of the world’s best boxers fight but not so eager to pay for the privilege. Or perhaps it was the customary Croke Park pitch invasion, the mainstay of victorious GAA fans since the beginning of time. After Ali finally shook off Lewis with an eleventh-round stoppage, the ring was swamped with spectators eager to congratulate him, forcing him to battle his way through crowds for a half an hour before he made it back to the dressing room. Yes, there was something peculiarly Irish about it indeed. Croke Park has been the site of many weird and wonderful goals over the years, but none as bizarre as Barney Rock’s “ghost goal” in the 1987 National Football League quarter-final between Dublin and Cork. The story has long since entered into GAA folklore. With the game after 70 minutes, both sides headed back to their respective dressing rooms, ostensibly to prepare for extra time. Or not. Cork, it seemed, were getting ready to go home. First, the Rebel selectors explained that they had never been informed that extra time would be played in the event of draw. Then, with the players changed and adamant that they weren’t playing on, came the icing on the cake. Cork announced that they couldn’t afford to stand around and debate the issue — they had a train to catch. And off they went, leaving the Dubs to retake the field alone, win the uncontested throw-in, and launch it to Rock who scored into the empty net to seal victory. 21 June 2003. A special day for Irish sport. With the eyes of the world on Drumcondra, 75,000 people crammed into Croke Park to officially open the Special Olympics World Summer Games. The ceremony itself was the culmination of years of planning, every last detail orchestrated and choreographed to the second. And so when Bono broke off from the closing bars of Pride to bring Nelson Mandela out on stage, there was nothing remotely spontaneous about it. Yet it was a powerful moment, beautiful in its simplicity, untainted by Bono’s insuppressible urge to literally bow down in front of one of the 20th century’s political icons. Mandela’s appearance was fleeting, but the 84-year-old’s beaming smile radiated throughout the stadium and throughout the country. The 2003 Special Olympics was open. Until Bryan Cullen decided to give Copper Face Jacks the best two seconds of free advertising it has ever had, Seán Óg Ó hAilpín’s 2005 All-Ireland Hurling Final address had a legitimate claim to be the most iconic GAA victory speech. The immortal line “Is fada an turas é ó Fiji go Corcaigh agus ó Corcaigh go Pairc an Chrocaigh” (“It’s a long way from Fiji to Cork and from Cork to Croke Park”) summed up in a sentence Ó hAilpín’s personal journey and that of the team which he had just skippered to back-to-back All-Ireland titles. It may be a while before that one gets reused on All-Ireland Sunday. It’s not unusual for a sense of occasion to smother a sporting event, overshadowing it until it peters out into a damp squib. Mercifully, on the evening that the English rugby team strode out onto the hallowed turf of Croke Park, that wasn’t the case. Leaden with the weight of history, Ireland v England in the 2007 Six Nations was more than a game. It was a symbol. But in the days and weeks leading up to the match, nobody was too sure what exactly it would come to represent. In the end, the significance of the occasion was marked perfectly, the tone spot on from the off. God Save The Queen was impeccably observed; Amhrán na bhFiann and Ireland’s Call sung with such passion as to wring tears from the hardest men in the game. And then, fittingly, it was all about the sport as Ireland put on a performance for the ages, romping to a 43-13 win, writing themselves into history’s next chapter. Email “The Magnificent Seven: Croke Park memories”. Feedback on “The Magnificent Seven: Croke Park memories”.